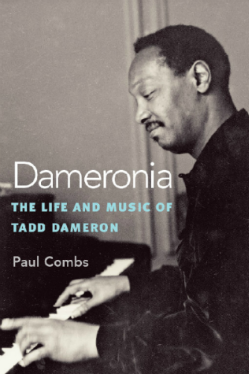 Paul Combs set himself a considerable challenge in Dameronia, his new biography of arguably the most influential composer and arranger of the bebop era. By Combs’ own admission, the record of Tadd Dameron’s personal history is a sketchy one. Dameron was “secretive almost to the point of paranoia,” and frequently provided interviewers with false or misleading information about his life (such as an occasionally mentioned stint as a premed student that never in fact took place). The inevitable result of this guardedness is a book that is only intermittently satisfying in its treatment of Dameron’s biographical background. But musicians and composers will find Combs’ book invaluable in its precision analysis of the seminal works of this singular jazz talent. It’s when Combs turns his own attention to the music that Dameronia proves its worth as a piece of jazz scholarship. A composer and music educator, Combs is fully equipped to tackle the technical particulars of Dameron’s work, and the book features detailed beat-by-beat, sometimes bar-by-bar breakdowns of “Good Bait,” “Hot House,” the ambitious Fontainebleau album and numerous other Dameron classics. Many of these analyses are accompanied by staff notation, and Combs’ explanations are heavy on musical jargon that may prove dry or impenetrable to those not schooled in theory. (I’m not ashamed to admit I had to look up “contrafact,” a term Combs utilizes with some frequency.) But to readers with a musical background, particularly those interested or educated in jazz composition and arranging, these probing and intelligent explorations of an unsung great’s work make Dameronia an essential addition to their library. The Amazing Bud Powell: Black Genius, Jazz History, and the Challenge of Bebop by Guthrie P. Ramsey Jr.